Heure Bleue Palais Client Comments, Reviews and Testimonials. 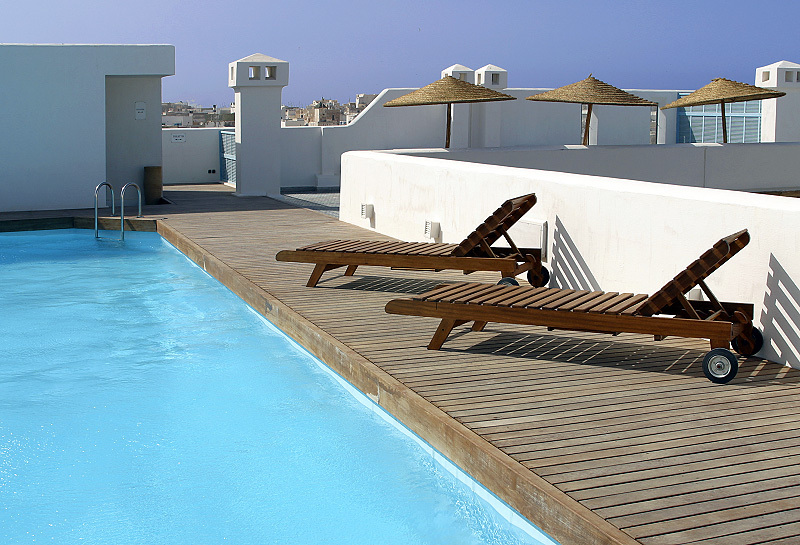 Book Heure Bleue Palais Today with Hip Morocco - Holiday Accommodation in Essaouira , Morocco. "The charm and luxury of refined elegance coupled with traditional North African charm"
Built on the site of an ancient fondouk, l'Heure Bleue Palais is an elegant and traditional Moroccan residence which was lovingly restored in 2004 to recreate the atmosphere of a genuine riad, and to blend with the surrounding medina of Essaouira. The palace offers all the comforts of a five star hotel and is equipped with the latest technology (elevator, air conditioning, internet connection in every room and Turkish baths). 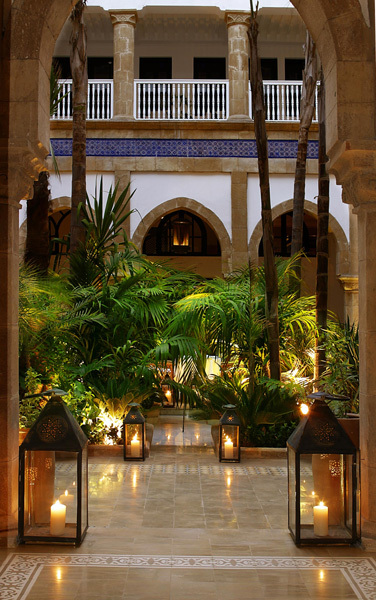 Traditional Moroccan architecture plays on light and shadow, and the open air galleries provide a colourful atmosphere. 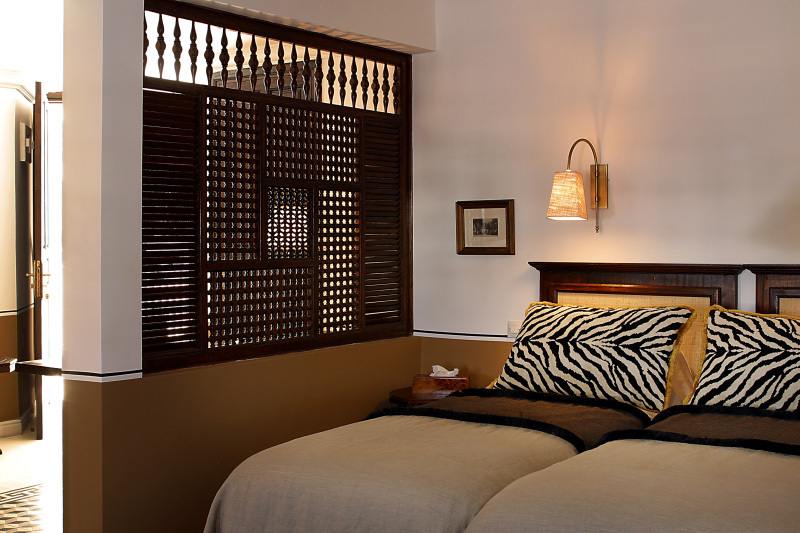 All 16 rooms are decorated in the colonial African style. 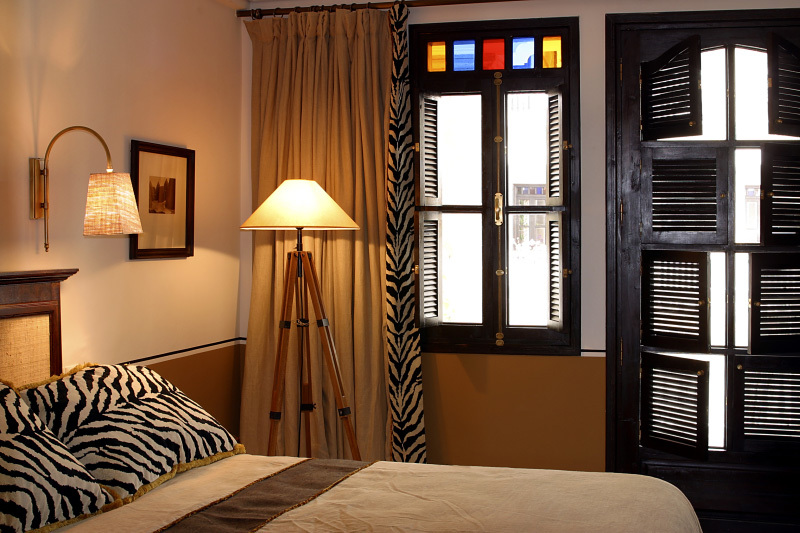 The suite decors are based on different themes that reflect the history of this ancient Portuguese town. 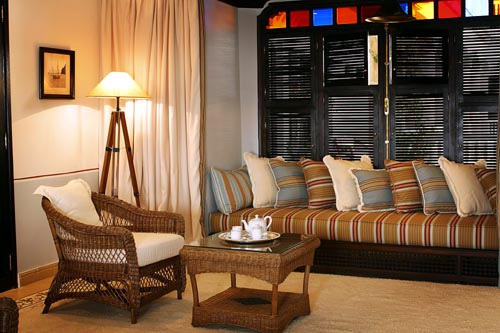 Suites are decorated in Portuguese (pastel and blue tones), English colonial (engravings and drawings that recount the colony's history), African (traditional costumes), and Eastern styles (gold and burgundy tones). The talented chef Sylvain Scotti comes from Lyon, France and proposes gourmet French cuisine accented with Moroccan flavours. Meals are served in the Moroccan lounge, where a hint of cedarwood floats from the spectacular sculpted ceiling. Lunch is available on the central patio, the poolside or on the rooftop terrace. Light and simple meals to be enjoyed whilst admiring the stunning view from the terrace. Number 1 recommended in Essaouira, this hippy chic restaurant offers top quality Italian-Moroccan fusion food. Seafront restaurant with a wide range of fresh seafood. French owned, La Table offers a great range of choices for all budget, delicious seafood in a friendly and vibrant atmosphere. The best Italian food in Essaouira in a cosy authentic Italian setting. Includes gommage exfoliation with black soap and eucalyptus - ghassoul purifying wrap - traditional massagw with argan oil. "The purpose was to enjoy 7 days of relaxation in an interesting place. We had not been to Morocco before. From our perspective, this hotel proved to be ideal. The building is interesting (so glad we did not opt for a typical European hotel), without exception, all the staff were professional, helpful and friendly from the moment of arrival until our departure. By using the hotel's special 7 nights offer, we were able to combine cultural insights, exploratory trips and distinctive activities (incl camel riding, quad biking and a cookery workshop) all tailored to our specific requests on timing etc for which Naima merits special thanks. Essouira is small (and it is as it says a "windy city" but there is plenty to seek out if you wish." "They picked us up at the airport and we were welcomed to the hotel with mint tea and nibbles and sat in the beautiful courtyard while they took our bags up to the room. We were then shown to beautiful suite with the fireplace in the centre. Breakfast is fab here with loads of choice and the service is amazing. The beach is a short walk so you can do long walks on the beach every day and even the harbour is only a short 10-15 minute walk. 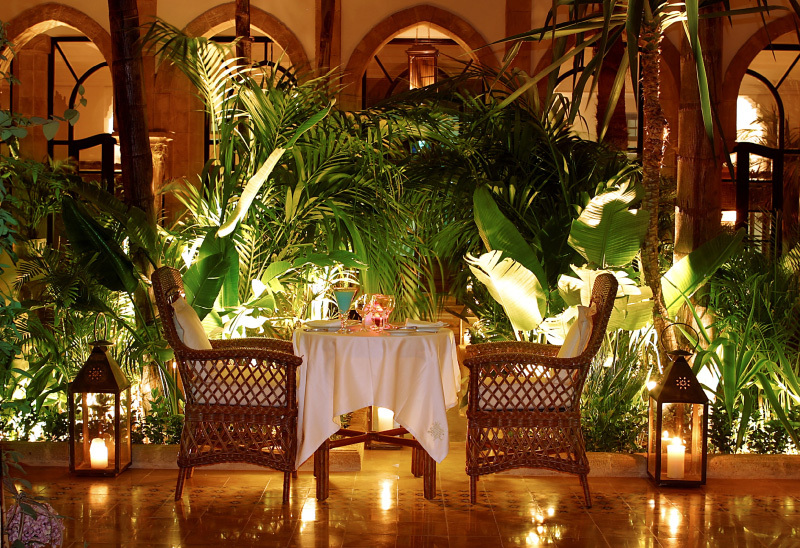 Essaouira is small so all restaurants are nearby, the staff can advise and book any of your choice for you. One day it was raining so Kamal put a DVD on for us in the cinema. Take your own DVDs to play in the room if you don't speak French and on cold evenings it's nice to sit by the fire in your room. The management here were very hands on checking everything was just right for the guests, room service is very fast and the restaurant is lovely with a different menu every day. They serve organic wine from Val D'Argan and other wines as well." Hidden behind the walls of la medina, Heure Bleue Palais is the first place new comers see upon entering Essaouira's old medina. It is the perfect location for a romantic getaway, only a 5 minute walk to the white sandy beach and to the best restaurants in Essaouira. 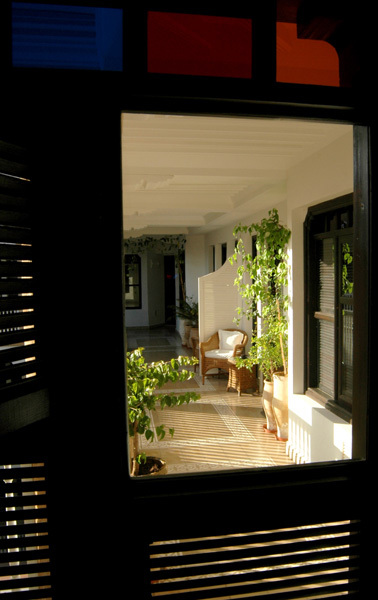 On the first floor, the rooms are clustered around the patio. 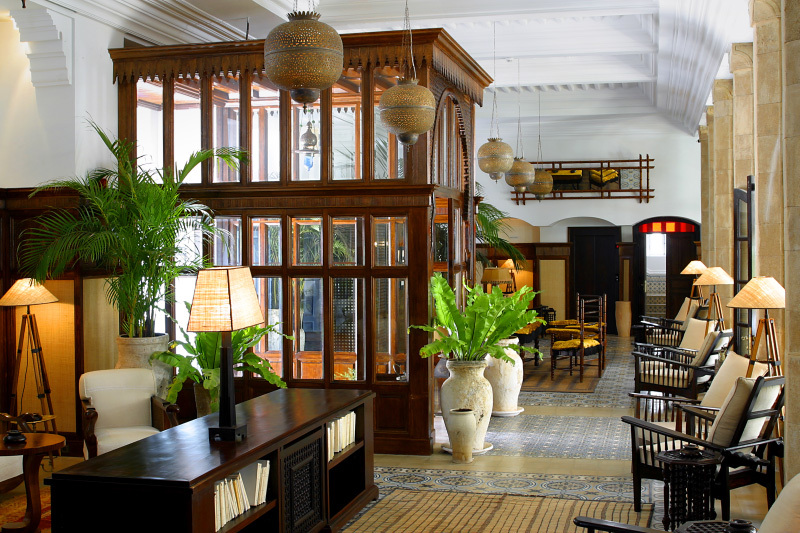 Decorated in a colonial African style, tastefully appointed and protected from the sun’s glare by stained-glass, shuttered windows, they are attractive and comfortable, offering all the amenities of a fine hotel, including marble ensuite bathroom with a spacious shower, room service, Internet, DVD player and more. 30m2. 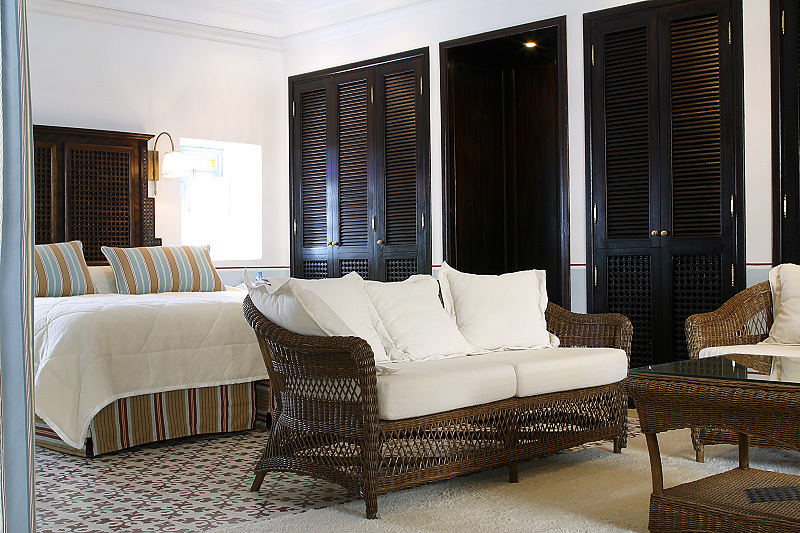 The suites are spacious, gracious, and offer a choice of décor influences: African, Oriental, Portuguese or British Colonial. They offer everything to make a guest feel truly pampered, from luxurious marble bathrooms with a bath, to small details like clothes closets lined with fine wood. 45m2. 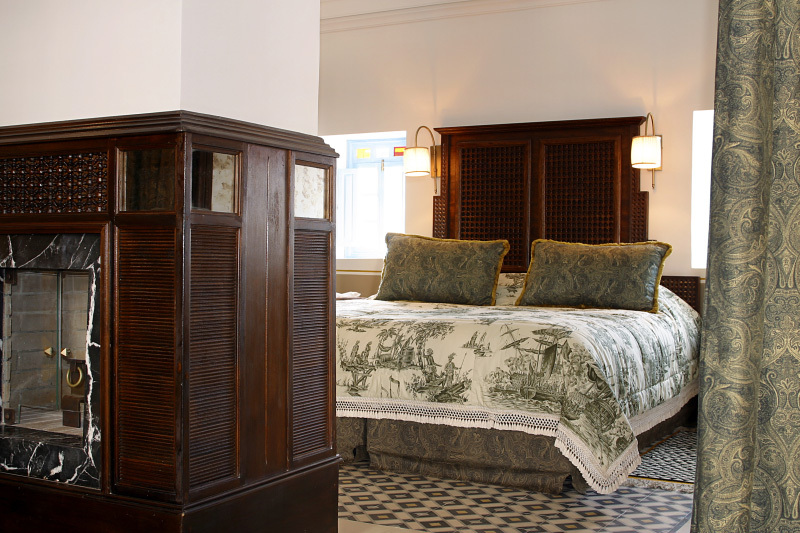 The suites are spacious, gracious, and offer a choice of décor influences: African, Oriental, Portuguese or British Colonial. They offer everything to make a guest feel truly pampered, from luxurious marble bathrooms with a bath and separate shower, to small details like clothes closets lined with fine wood. Some Senior Suites have fireplaces. 60m2. 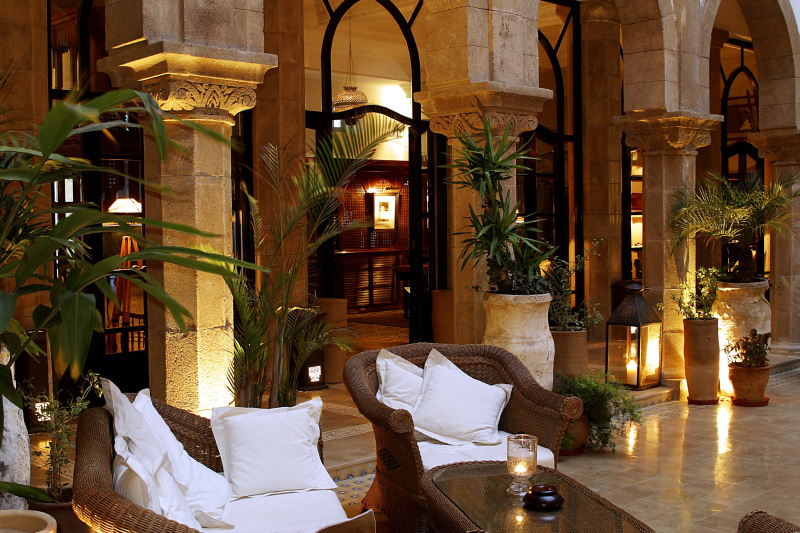 The base rate price at Heure Bleue Palais is in pounds, euros, or Moroccan dirhams and exchange rates are approximate.